To focus more on Zhouzhuang, we customized our tour to following: Day 1 Arrival in Shanghai Arrive at Shanghai, have a city tour to the Bund, Nanjing Road. The Bund: Shanghai\'s famous waterfront to see new-erect modern skyscrapers and aged buildings of the colonial period. The bund is a must-see site when visiting shanghai. architectural styles include gothic, baroque, romanesque, and renaissance period. Nanjing Road: the busiest shopping street in Shanghai. Day 2 Shanghai Visit Oriental Pearl TV Tower, Yu Garden & Shanghai Museum. Yu Garden: It used to be a private garden with 400 years\' history; it features traditional architectural style of Yangtze Delta. Oriental pearl tv tower: standing by the huangpu river at 468 meters tall, oriental pearl TV tower is the highest TV tower in Asia and the best viewing spot of Shanghai. 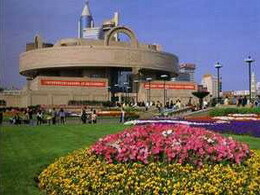 Shanghai Museum: the biggest museum in china, with a collection of over 120,000 pieces of Chinese art & cultural relics. The museum is especially famous for its treasure of bronzes, ceramics, paintings, and calligraphy. Day 3 Shanghai - Zhouzhuang - Shanghai Drive to visit Zhouzhuang, the No. 1 Water Town of China. Visit the Hall of Shen\'s residence, the Milou Tower and the Chengxu Taoist Temple. Transfer back to Shanghai before dinner time. Day 4 See off Price per person: 1 person : $529 2-4 persons : $329 5-8 persons : $299 >8 persons: $269..